Jalaun is a city in Uttar Pradesh state in northern India. The town was formerly the residence of a Maratha governor, but never the headquarters of the district, The HQ. of the District is at Orai, a city on the Kanpur-Jhansi NH27. 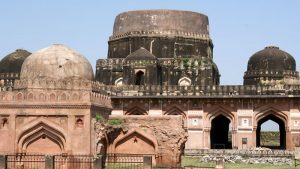 Chaurasi Gumbad (84 domes) is a square nine domed structure in a walled courtyard with two graves under central dome. The probable date assigned to this gumbad late 15th or early 16th century. This Islamic architecture is believed to be a tomb of one of the Lodi Sultan. It has 84 door arches. Built of blocks of rubble the whole building is divided into square spaces as in a chessboard, by eight lines of pillars that are linked by arches and topped by a flat roof. The building has a dome of a height of 60 feet. Jaunpuri motifs can be seen in the wall of the Gumbad. It is located to the west of old Kalpi along with NH 25 towards Orai. This monument is a royal tomb from Medieval times (of Lodhi Sultans). In the ancient times Kalpi was known as Kalpriya Nagari. As time passed the name of the city was abbreviated to Kalpi. Kalpriyanagari is an ancient Indian city. It had a sun temple of the size of a football ground or even larger. It was in 4th century that King Vasudeva founded Kalpi. The town is said to be protected by Brahma, Vishnu and Mahesh, the three chief Hindu Deities. 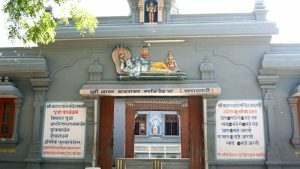 MAHABHARAT KE RACHAYITA YANI WRITER OF MAHABHARAT – VEDVYAS KA BIRTH PLACE KALPI HAI. Kalpi is a town and a municipal board in Jalaun district in the Indian state of Uttar Pradesh. It is on the right bank of the Yamuna. It is situated 78 kilometre south-west of Kanpur from which it is connected by both road and rail. The town was captured by the British in 1803, and after 1806 remained in British possession until India’s independence in 1947. 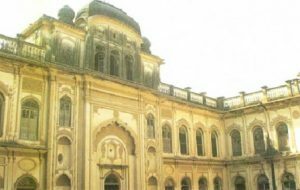 Kalpi was a part of Bundelkhand Agency, formed in 1811, and also housed its headquarters from 1818 to 1824. During this period the political agent to Governor General of India was appointed and headquartered in Kalpi. The British East India Company made it one of their principal stations for providing “commercial investment”. In May 1858 Hugh Rose (Lord Strathnairn) defeated here a force of Indian freedom fighters led by the Rani of Jhansi. 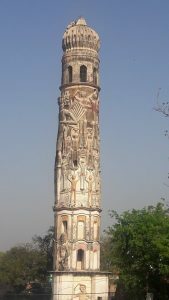 The fortified post of Kalpi, the former residence of the rulers of Jalaun State, was dismantled in 1860 by the British and its place was taken by a market known as Whiteganj. There are many places for visiting like Vyas temple, Lanka Meenar, 84 Gumbad and lots of Dargah like Khankhah the Dargah of Sayyad Meer Tirmiji. Kalpi is also birthplace of Ved Vyas ji. There is a Kali Haveli and Rang Mahal of Beerbal that called Rang Mahal. Railways- Kalpi is a major Railway Station of Kanpur-Jhansi railway section of North Central Railway. Roadways- Kalpi lies on NH 27 on Kanpur-Jhansi section of National Highway. It is connected to cities of Kanpur, Jhansi and Orai by UPSRTC Buses at Kalpi Bus Station. Airways- The nearest airport is at Kanpur near Chakeri (100 kilometres) which has flights to Delhi, Mumbai and Varanasi but is expected to be connected to major cities of India by 2019. Historical background : Fort was built in 1593 by Jagman Shah. Leaving 11th Century Fort on the backs of Yamuna River 3 km. because of erosion by the river. Presence and blessings of Sant Tulsidas who laid the foundation of the Fort and presented to the Raja one “EK MUKHI RUDRAKSHA” one DAHINAVERTI SHUNKH (Conch) and a Laxminarayan Bati. They are still worshiped & kept in the temple inside the Fort. Every year on this day a festival / function is held by the Raja in which public also participates with Pomp & Show. A Mela is held in the village. People from far & wide come to see the Fort and the festivities on the day in the month of October and have the Darshan of deity of Sengar Rajputs. Nestled deep in the Chambal ravines of Bundelkhand, stands the more than 600-year old Fort Rampura – proud and stoic, as if defying the ravages of time. 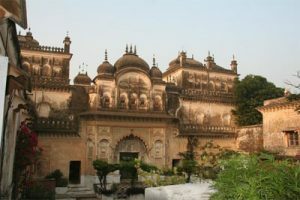 After being in the family for fourteen generations, Raja Samar Singh and his family now offer Fort Rampura as a unique homestay destination for guests who wish to experience the true-blue feudal and country life of the erstwhile nobility of Bundelkhand. Well-connected to Lucknow, Kanpur, Jhansi, Delhi, Jaipur, Agra and Gwalior, this six- hundred year old ravine retreat provides an ideal getaway if you’re looking for a short weekend break. For travellers who like to enjoy wild India at their own pace, it’s a place to relax, unwind and discover a rich rural landscape that has been given a miss by distractions of modernity. And we are not complaining.